Bioeconomy Community Development Programme (BCDP) is the lead component of Bio-Accelerator programme under Bioeconomy Transformation programme (BTP). BTP is a platform for the private sector to channel and maximise commercial opportunities in bio-based industries. 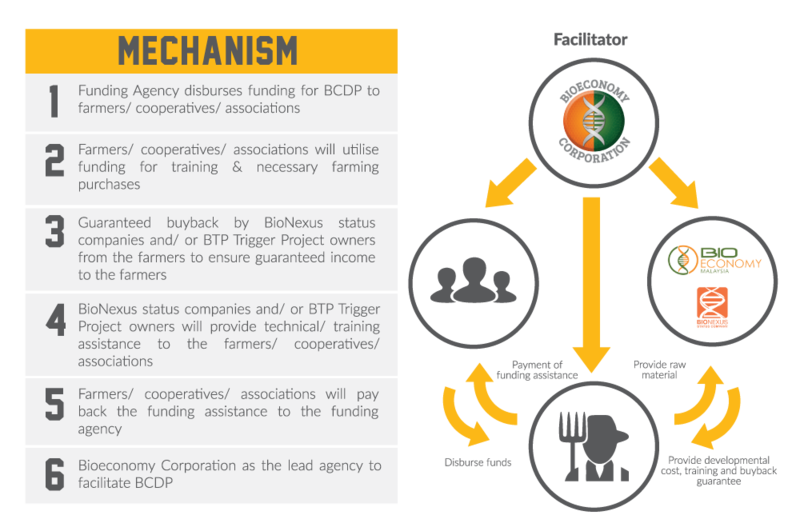 BCDP involves the enlistment of rural farmers and settlers to cultivate raw materials potentially as inputs for BioNexus companies and BTP project owners. The proposed contract farming mechanism with guaranteed buyback will generate additional income for the programme participants. It also provides a foundation for the upstream and downstream portion of the Bioeconomy industry supply chain.